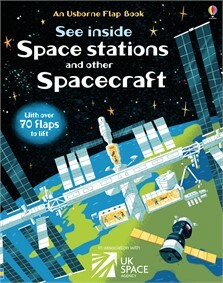 Take a tour of the ISS. Watch a video clip with lots of fun facts about the ISS. See how the ISS has been assembled section by section since 1998. Listen to an astronaut answer questions about life in space. See views of the Earth filmed by an astronaut aboard the ISS and find out more about life in space. Examine a replica of the Mars rover, "Curiosity". The replica is used by scientists on Earth. Watch the nail-biting moments when "Curiosity" landed on Mars. See how humans may explore and live on Mars in the future. How old would you be if you lived on Mars? Find out about the Voyager space probes that have ventured beyond the Solar System into deep space. See a Soyuz rocket being taken to a launch pad and watch astronauts as they prepare for launch. Watch a space rocket blast off into space and see what the astronauts are doing. Highlights of Apollo 11's mission to the Moon and back. Watch an astronaut train for space by being spun around in a machine. Find out about a robot that will help astronauts in space. Try a quiz about the ISS. Design your own satellite and build a model of it at home. My little boy aged 6 was over the moon to open up his envelope and find a book about Space. We loved opening all the flaps and absorbing all the factual information inside. It is so in depth and beautifully illustrated but done in a fun and engaging way to capture a child's imagination. This has become a firm bedtime read and has led to many other questions. We love the flaps, illustrations and facts used inside this book.